This page covers advantages and disadvantages of Organic Solar Cell. It mentions Organic Solar Cell advantages or benefits and Organic Solar Cell disadvantages or drawbacks. Introduction: Solar cell is a device which converts solar energy into electric energy. It generates electricity from radiant energy from sunlight using photovoltaic effect. In order to generate desired solar power, number of solar cells are connected together. This configuration of solar cells is known as PV modules or solar panels. Following are the three types of solar cells. What is Organic Solar Cell? • It consists of thin layers of organic semiconducting materials. Hence the name "Organic Solar Cell". 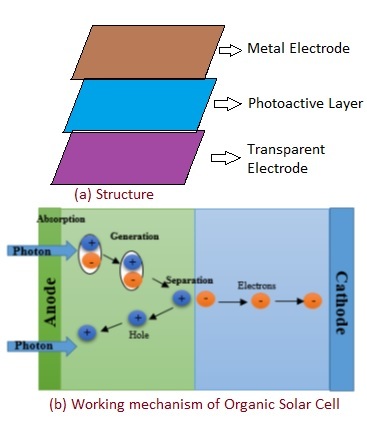 • The basic structure as shown in figure-1(a) consists of photoactive layer sandwiched between two thin film electrodes where one electrode is semi-transparent. The semi-transparent electrode allows sunlight to enter into the device. • Photoactive layer is composed of two different types of semiconductors (e.g. donor, acceptor) which forms hetero-junction similar to p-n junction of inorganic solar cell. • Sunlight consists of radiant particles known as photons. ➨Working principle of Organic solar cell as shown in figure-1(b) can be summarized as follows. • The photons from sunlight is absorbed into photoactive donor material. • Above process generates excitons i.e. tightly bound electron-hole pair. • The excitons move towards Donor-Acceptor interface where it get separated into charge carriers (i.e. electrons and holes) at the interface. • After separation process, holes move toward donor material (i.e. anode) and electrons move toward acceptor material (i.e. cathode). • Collection of charges at relative electrodes results into generation of electricity due to stready flow of charges into external circuit. ➨Organic Solar cells are 1000 times thinner compare to silicon solar cells. Hence it results into huge savings on materials and consecutively they are cheaper. ➨It is flexible due to use of PV modules. ➨It offers short energy payback time. ➨It is easy to integrate. ➨The efficiency of organic solar cells is less (about 5%) compare to silicon solar cells (about 15%). They are stable in the dark but degrade in the light conditions. Moreover as electricity can not flow very easily in organic solar cells (OSCs), its efficiency is limited. This is due to poor generation as well as extraction of electrical charges in OSC. ➨Its lifetime is less compare to inorganic solar cell as organic materials degrade rapidly in ambient exposure. Moisture and air along with sunlight further degrades its performance over time.